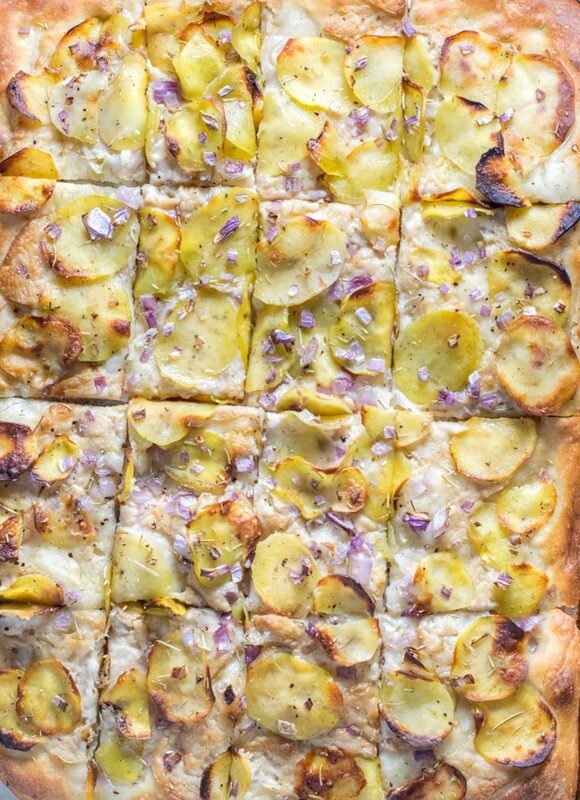 Potato pan pizza is what dreams are made of. 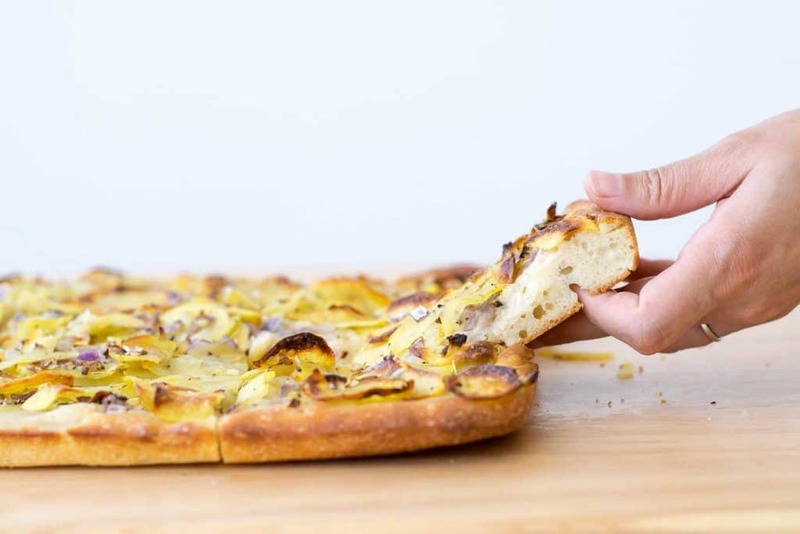 Chewy, doughy pan pizza with crispy slivers of peppery, salty potatoes, sweet bits of onion, heady rosemary, and creamy vegan mozzarella. Did I just describe the most perfect, indulgent pizza? I think so. 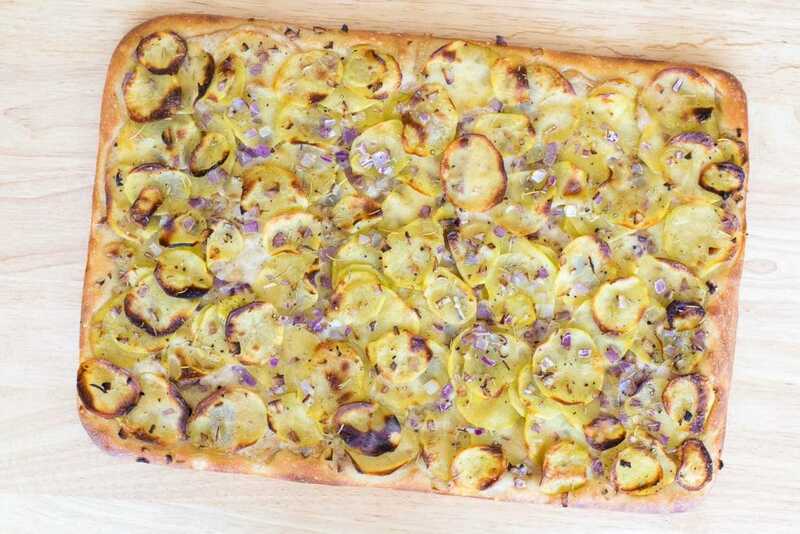 This pan pizza is my take on pizza con patate, an ‘accidentally vegan’ option common in Italy. In my version, potatoes are thinly sliced with a mandolin (a sharp knife will work, just cut them as thin as possible) and then soaked in hot salty water for at least one hour. The brine softens the potatoes and removes excess starch, so they are able to cook up crisp quickly in the oven (this is also a common way of prepping for french fries). At the end of the soak the potato slices are soft and flexible. Drain them and squeeze dry in a towel. The potato slices are tossed with diced red onion, rosemary, and lots of freshly ground black pepper. No salt needed thanks to the soak. For the crust, I turned to my favorite bread book author, Ken Forkish, for inspiration. For the potato pizza I wanted a thicker and sturdier crust that also required more baking time than my usual 8-minute pizzas. The pan pizza uses higher protein flours, either 00 flour or bread flour, for a chewier result, which is perfect for this purpose. Baking it in a larger quantity in a sheet pan instead of straight on a pizza stone or steel guarantees the longer bake time. The dough is easy to make, requiring only one easy minute total of kneading and some patience. I modified the method slightly for a more relaxed and flexible schedule by using the fridge, which slows down the proliferation of yeast and also allows for more flavor to develop in the dough. This does require planning out your pizza dinner the night before or the morning of pizza-baking day. However, if you decide you want pizza just a few hours before dinner time, you can 1) allow the dough to rise at room temperature for 4 hours before shaping and assembling, or 2) buy some store bought dough (~2 lbs). When the pizza dough is ready to go it’s easy to assemble. Ease the dough out of the bowl it’s been proofing in, straight onto an oiled, rimmed half sheet pan. Stretch it gently with your fingers until you reach resistance, the gluten will cause the dough to spring back slightly. Let the dough rest for several minutes, then pour a little olive oil on top of the dough and spread it out with your fingers while simultaneously stretching it out all the way to the rim. Sprinkle some garlic over top, and then add your desired amount of vegan mozzarella. On top of that spread out the potato mixture, overlapping is fine, but you’ll want to spread out any slices that are clumped together. At this point your pizza is ready to bake (and your oven has been preheating for 45 minutes to 1 hour)! Beware, your house will smell insanely good while the pizza bakes, to the point that your dog may wake up from her nap to come beg for yummy treats. I love pizza, and we eat a good amount of it around here. This pizza is one of my favorites to indulge in. Though, I probably say that to all my pizzas. If you make this recipe, please let me know! Leave a comment below, rate it, or tag me on Instagram! You can use either russet or yukon gold potatoes for the pizza. I have used both and enjoyed the results. For the photos in this post yukon gold potatoes were used, but I used russet potatoes this time. Substitute store bought pizza dough if you’d like, you’ll need 2 lbs of it for a half sheet pan pizza. If you don’t like to use vegan cheese, this is a good pizza to leave it off, since traditionally it doesn’t have cheese on it. But I like the extra creamy richness that vegan mozzarella provides. 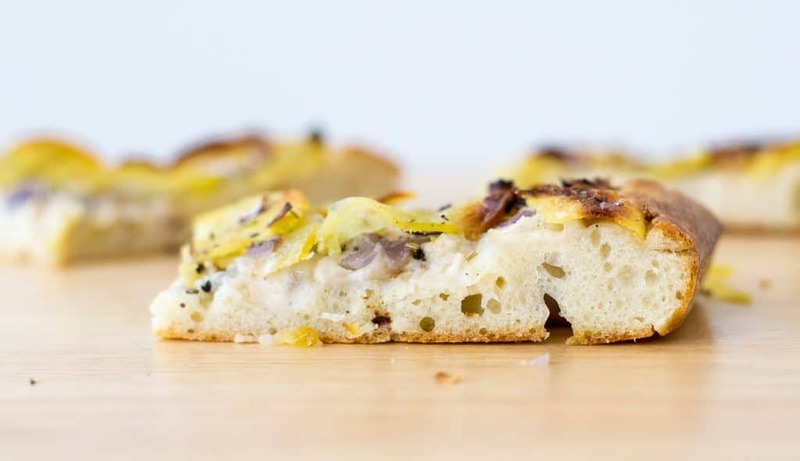 My favorite pairing with potato pizza is Miyoko’s Kitchen Smoked Mozzarella, but your favorite melty vegan mozz will be good! 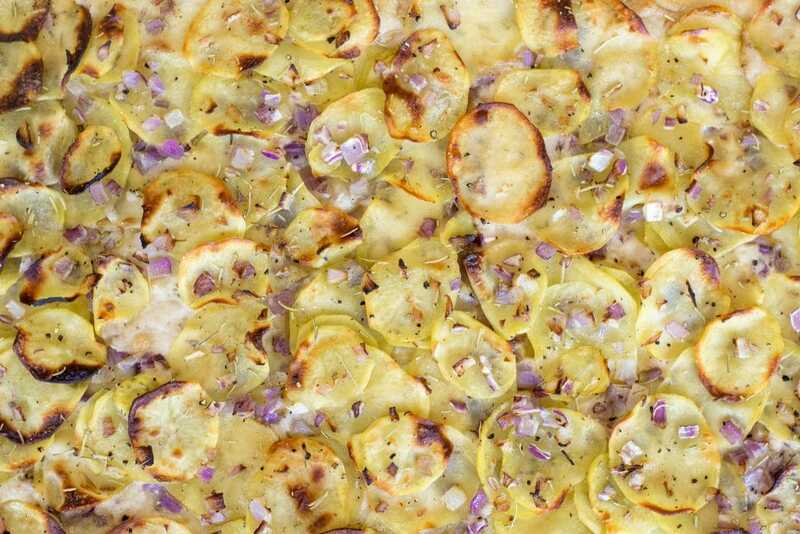 Crispy slices of salty potatoes, sweet bits of onion, heady rosemary, and creamy vegan mozzarella top this perfect, indulgent vegan potato pan pizza. Mix water and salt together and stir to dissolve the salt. Add the yeast and let hydrate for a couple of minutes, then stir that to disperse. Add the flour and mix it together with your hands. Then, wetting your hands to prevent the dough from sticking, squeeze sections of it between your thumb and first or middle finger to break it into several segments. Then scoop under the segments of dough and gently pull a section of the dough up and then fold it on top of itself. Rotate the bowl and repeat the gentle lift and fold a few times until you've gone in a full circle and the dough is a single mass again. Then repeat the segmenting and folding a couple more times (about 1 minute total pinching and folding time). The gluten in the dough will start to develop during this process. Finish on a fold, and rotate the dough so the seams on the fold are facing the bowl. Cover the dough and let rest for 20 minutes. Then turn the dough out onto a clean, floured counter and knead the dough for around 1 minute, until the dough is not too sticky and has developed a smooth skin. Lightly oil the bowl, and return the dough to the bowl. Cover and let rise for 1 1/2 - 2 hours, then move the dough to the refrigerator for several hours, or up to 24 hours. Remove from fridge around 1 1/2 hours before you are ready to bake. Preheat the oven to 550 ºF, or as hot as your oven goes, 1 hour before you are ready to bake the pizza. Prepare the potatoes. Using a mandolin on the thinnest setting, or using a sharp knife, cut the potatoes into super thin slices. Fill a medium mixing bowl with the hot water and dissolve the heaping tablespoon of salt into it. Place the thinly sliced potato in the bowl and let sit for 1 hour, or prepare this up to 12 hours earlier and let sit in the fridge (moving once the water has cooled to room temperature). This will help remove starch from the potatoes so they bake crisper. When the potatoes are done soaking and you are ready to use them, drain the water and gently squeeze the potatoes with your hand to remove excess water. Then using paper towel or a clean lint free dish towel, place the drained potatoes on the towel and roll it up gently squeezing to remove as much excess moisture as you can. Transfer the dried potatoes to a medium mixing bowl, and toss in 1 tablespoon of olive oil, red onions, rosemary, and lots of freshly ground pepper. 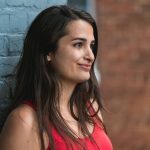 In a large, rimmed, half sheet pan (~18 x 13"), pour around 1 tablespoon of olive oil and spread it around with your fingers to coat the bottom and rims of the pan. At this point the dough has rested for around 90 minutes outside of the refrigerator. Turn it out the dough onto the pan and gently push it to spread until the dough resists. Let the dough rest for 10 minutes. Then pour around 1 tablespoon on top of the dough and spread it around with your fingers, gently stretching the dough the rest of the way to fill the pan. Sprinkle the minced garlic over the dough, then cover with your desired amount of cheese. Arrange the sliced potato mixture to cover the dough. 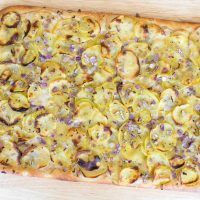 Bake the pan pizza for 15 minutes, then rotate and bake an additional 10-15 minutes or until the potatoes are golden and crispy, some burnt edges are okay, and any visible crust is also golden. If needed, turn the oven to broil for the last 1-2 minutes to brown the top.